It was another incredible day here in the valley. Temperature was in the mid 70’s and the sun was shining in all it’s glory. And a a big bonus is was Friday. As I walked down the path sweating up a storm I saw the cool river flowing past. 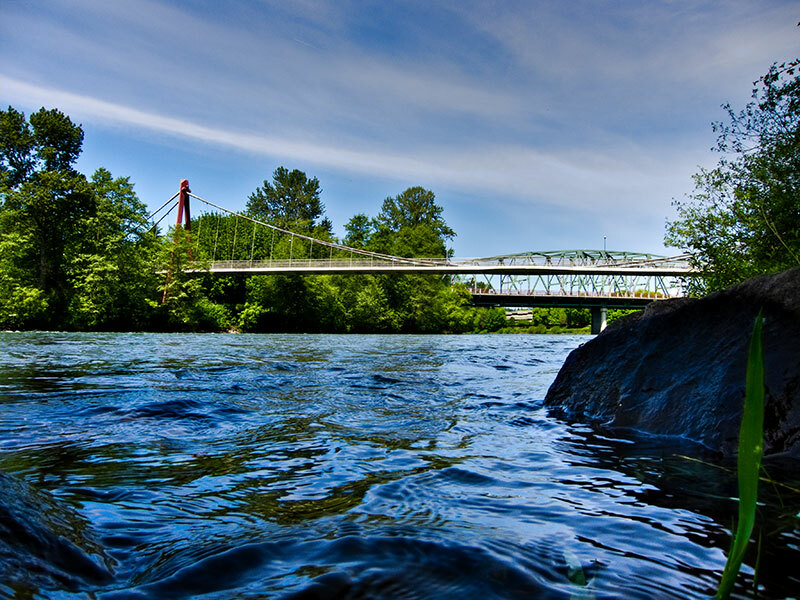 I walked down to the edge and took this picture of the Willamette River. In the background is the DeFazio footbridge crossing over into Alton Baker Park and just beyond that is the Ferry Street bridge. I like the low perspective of this shot. As I sat down near the edge of the water I really wanted to just sit there for the rest of the day. It was so nice and peaceful and relaxing. It seems strange at times how we often let work and other perceived obligations get in the way of really enjoying a bit of life. If we don’t take advantage of opportunities now then when will we? This photo is composed of 3 different variations of a single RAW file. I guess you would call it a pseudo HDR (High Dynamic Range). I took the single RAW file and then adjusted the exposure to create 3 images: -1.0, -0.5 and 0. I then combined all three in Photomatix Pro and tone mapped to my liking.